Rice was first domesticated in Asia as Oryza sativa, 10,000–15,000 years ago. The earliest confirmed archaeological evidence dates from 10,000 years BP in the Yangtze valley in China. Molecular evidence suggests that rice was domesticated independently at least twice, in widely different locations and from different ecotypes of wild ancestors of the O. rufipogon–O. nivara complex. The two origins are now associated with two mega-groups of varieties known as japonica (with the closely-related javanica now known as tropical japonica, and the Basmati/Sadri types of aromatic rices) and indica (with the somewhat similar deepwater types). The O. sativa genepool is now a highly diverse and complex mix with many intermediate forms. It forms a broad band of primary genetic diversity that extends from the Ganges plains below the eastern foothills of Himalaya, through upper Myanmar, Laos, Thailand and Vietnam, to southern China. There are two mega-centers of diversity, one centred in Yunnan province of China and stretching west to Nepal and east to the Red River delta of northern Vietnam, and the second centered in northern India and Bangladesh. A second species, O. glaberrima, was domesticated in West Africa from O. barthii, probably about 3,500 years BP. Unlike O. sativa, cultivation did not spread outside the region of domestication. With its comparatively short domestication history and narrow range, the species is less diverse than O. sativa. Rice (Oryza spp.) is a staple food for about half of the world’s population. It is grown commercially in more than 100 countries on all continents except Antarctica, although the great majority of production and consumption is in Asia. Rice can be considered semi-aquatic, not suited to very dry areas. While it can be grown with normal water supply like other cereals (‘upland rice’), the most intensive production systems are, uniquely to rice, under conditions of controlled temporary flooding (‘lowland rice’), either rain-fed or irrigated. The flooding kills weeds and some soil borne pathogens such as nematodes, and also maintains high organic matter in the soil. Also unlike other cereals, rice is not exclusively an annual crop, and in some areas a so-called ‘ratoon crop’ is produced by vegetative regrowth from the stubble left after harvesting the main first crop. In addition to the two main cultivated species, the genus Oryza contains about 25 wild species and two hybrid groups of dubious status. The species of Oryza are grouped into series of more or less inter-fertile species complexes. The two cultivated species and six of the wild species share the same genome in the ‘O. sativa species complex’ and the comparative ease of interspecific crosses within this complex has resulted in the effective use of wild species for transferring new traits into O. sativa, particularly for disease and pest resistance, but also for a number of other genes, including the CMS (cytoplasmic male sterility) gene used to start the hybrid rice industry. Molecular evidence also points to extensive historical crossing between variety groups, generating many intermediates between the groups, so that classification remains difficult. In addition, introgression between wild and cultivated forms is still common wherever the wild ancestors grow close to crops. Thus the process of domestication is still continuing: wild genes continue to be introduced into cultivars and the wild genepool now contains many genes from cultivated varieties. Traditional rice varieties and wild rice species are being lost through genetic erosion and habitat loss. 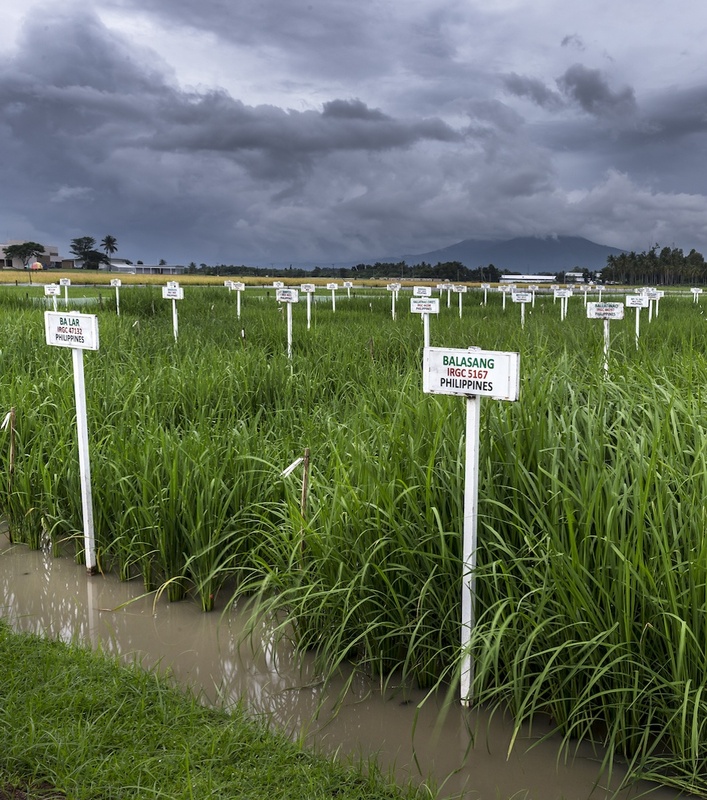 Farmers often adopt new, modern rice varieties, which displace older varieties, and when they switch from cultivating rice to growing other crops, the old rice seeds are also often forgotten. Wild rice species are particularly threatened with extinction as their natural habitats are under threat or destroyed. The most common, efficient and cheap method of conservation of rice diversity is in seed banks at low temperature (2 °C to –20 °C) and dry (moisture content of 6–7% fresh weight). Most cultivated rice accessions are conserved in seed banks. that produce recalcitrant seeds or no seeds. This is the case of O. longistaminata, O. neocaledonica, O. granulata, O. meyeriana and related genera such as Leersia, which do not produce enough seeds for storage. Porteresia coarctata has recalcitrant seeds. that do not flower in genebank regeneration conditions. This is the case of O. schlechteri and related genera such as Potamophila and Zizaniopsis at IRRI. that have special needs, where different species require different cultural practices. O. granulata and O. meyeriana for example, need partial shading and special soils, because they are originally from forest regions, whereas most of the other species need to be kept soaked because they are originally from swampy areas. More than 780,000 accessions of cultivated and wild rice are stored in genebanks in more than 40 countries. However, many of these accessions are duplicates, so this number does not represent numbers of distinct varieties. Major rice collections in CGIAR are maintained by the International Rice Research Institute (IRRI) and AfricaRice. CIAT maintains a working collection used for breeding rice for Latin American countries. 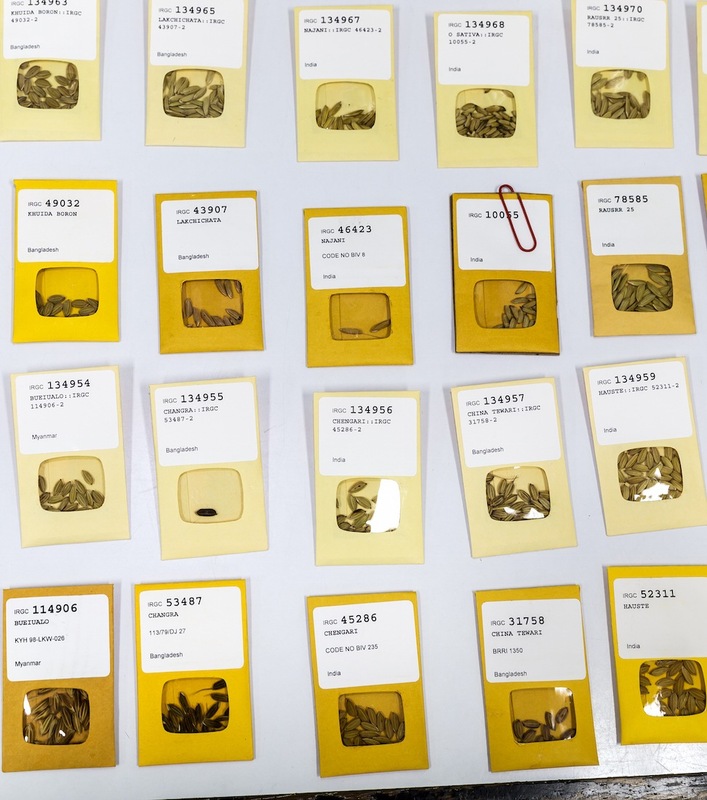 Other large collections are conserved at CAAS in China, which holds the largest collection of wild rice and related genera, Russia and the USA. See references on rice on the Crop Genebank Knowledge Base. Fulton TM, Chunwongsw J, Taksley SD. 1995. Microprep protocol for extraction of DNA from tomato and other herbaceous plants. Plant Molecular Biology Reporter. 13(3):207–209. Mew TW, Misra JK, editors. 1994. A Manual of Rice Seed Health Testing. International Rice Research Institute, Los Banos, Languna, Philippines. Naredo MEB, Juliani AB, Lu BR, Guzman F, Jackson MT. 1998. Responses to seed dormancy-breaking treatments in rice species (Oryza L.). Seed Science and Technology 26:675–689. The Rice Knowledge Bank showcases rice production techniques, agricultural technologies and best farming practices based on International Rice Research Institute’s pool of knowledge from research findings, learning and media resources and in-country projects. Contributors: T.T. Chang Genetic Resources Centre-IRRI, Los Baños, Philippines (Ruaraidh Sackville Hamilton, Ken McNally, Flora de Guzman, Renato Reaño, Soccie Almazan, Adelaida Alcantara, Elizabeth Naredo); AfricaRice, Cotonou, Benin (Ines Sánchez); UPLB-University of the Philippines at Los Baños (Teresita Borromeo). External reviewers: Teresita Borromeo (UP College of Agriculture, Philippines), Taesan Kim (Korea, former head of RDA genebank). Information on current practices for genebank management of rice was provided by partners and was reviewed in the context of genebank standards.